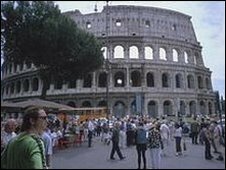 Two US tourists who chipped off a piece of the Colosseum in Rome 25 years ago have returned it - along with an apology for taking it. The fragment of stone, small enough to fit into a pocket, arrived in Italy in a package from California. A note inside read: "We should have done this sooner." Rome's archaeology officials have accepted the couple's apology and the local tourism officer has invited them to return to the city. The tourists appear to have been concerned about their questionable souvenir for a long time. "Every time I looked at my souvenir collection, and came across that piece it made me feel guilty," the note read. "Over the years, I started thinking that if all the visitors to that beautiful monument took a piece of it away with them, nothing would be left standing. "It was a selfish and superficial act." The head of tourism for Lazio, Claudio Mancini said: "The message is that visitors to our city continue to cherish it even after so many years."